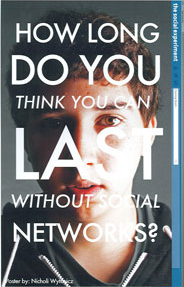 Cita Hati Christian School: ICT: How long do you think you can last without social networks? ICT: How long do you think you can last without social networks? Shoreline School District video production teachers Trent Mitchell from Shorecrest and Marty Ballew from Shorewood, who brought the world the famous student-produced lip dub videos a year ago, are back with a new competition. In The Social Experiment, more than 400 participating students from both schools will be expected to give up their social networks for a week: no texting, online gaming, internet chat, Facebook, etc., between Monday, December 6 and Sunday, December 12. Phone calls are OK, but preferably on a land line. In recognition of The Social Experiment, ABC World News Tonight with Diane Sawyer named the students and teachers of Shorecrest and Shorewood as its Persons of the Week on the Friday, December 10 national broadcast. Ballew and Mitchell's video students are creating movie trailers for promotional videos. So far they have created a video that satirizes The Social Network, Back to the Future, and Zombie films. During the Social Experiment week, video students will be shooting footage and interviewing students, staff, and parents about the whole project. Each student will make a documentary that focuses on the weeklong project from a personal perspective (how did they do during the week, why did or didn't they make it? ), a school-wide angle, or comparing the weeks at both schools. They will prepare by watching and analyzing professional documentaries in class. Shorecrest and Shorewood video students will compete to see who makes the best documentary. Selected students will be "secret spies" to monitor the competition, but mostly it's on the honor system. The teachers say they are hoping the experiment will encourage their students to read more books, exercise, try a new hobby or art form, or write. Each student can chronicle his or her experience in a photo essay or short video. Cita Hati Christian School: Waking up..